Cliff Richard was born Harry Roger Webb on October 14, 1940, in the city of Lucknow in Uttar Pradesh, India. In 1940 Lucknow was part of the British Raj, as India was not yet an independent country. Webb’s father worked on as a catering manager for the Indian Railways. His mother raised Harry and his three sisters. In 1948, when India had become independent, the Webb family took a boat to Essex, England, and began a new chapter. At the age of 16 Harry Webb was given a guitar by his father. Harry then formed a vocal group called the Quintones. Webb was interested in skiffle music, a type of jug band music, popularized by “The King of Skiffle,” Scottish singer Lonnie Donegan who had an international hit in 1955 called “Rock Island Line”. In 1958 Webb became the lead singer of a British rock group named the Drifters. It was during this time that Harry Greatorex, who was promoting the band, gave Harry Webb the stage name, “Cliff Richard.”As rock and roll made some people think of rocks, Greatorex reasoned that “Cliff” would be a rock solid name for the young 18 year old Harry Webb. Cliff Richard would go on to record nearly 150 singles that made it onto the UK charts. While his popularity in the USA was erratic, he was a big seller in Vancouver. On this survey of 1,130 songs he appears on 20 occasions. At the age of 16 Harry Webb was given a guitar by his father. Harry then formed a vocal group called the Quintones. Webb was interested in skiffle music, a type of jug band music, popularized by “The King of Skiffle,” Scottish singer Lonnie Donegan who had an international hit in 1955 called “Rock Island Line.” In 1958 Webb became the lead singer of a British rock group named the Drifters. It was during this time that Harry Greatorex, who was promoting the band, gave Harry Webb the stage name, Cliff Richard. As rock and roll made some people think of rocks, Greatorex reasoned that “Cliff” would be a rock solid name for the young 18 year old Harry Webb. Cliff Richard would go on to record nearly 150 singles that made it onto the UK charts. Cliff Richard had his first single on the Vancouver charts peak at number one in the fall of 1959. “Living Doll” became an auspicious beginning for a recording artist. Fans in Vancouver were wild about Richards. He had a string of hits between 1959 and 1966, and again in the late 70s onward. Of 26 singles that charted on the Vancouver pop charts, only two didn’t climb into the Top 20. His sixth Top Ten charting song was “Summer Holiday”, in the spring of 1963. From March 1963 to May 1966 Cliff Richard had 15 hit singles in the Top 20 on CFUN. Of these 12 made the Top Ten and three peaked at #1. In 1963 Richard won the Best UK Male Singer in the NME (New Musical Express) Reader Poll. In Vancouver, Cliff Richard’s follow up hit to “Summer Holiday” was “Lucky Lips” and simultaneously “It’ll Be Me”. This was a #2 hit in the UK in 1962 and #7 in Vancouver in the summer of ’63. While “Lucky Lips” climbed to #1 in Vancouver and #4 in the UK in the summer of ’63. Of the next eight singles after “It’ll Be Me”, seven made the Top Ten in Vancouver. The last of this particular string of hits into the fall of 1964 was “On The Beach”. 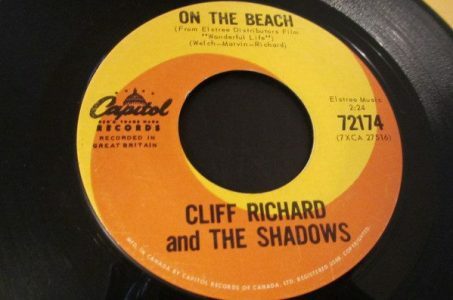 “On The Beach” was a song from Cliff Richard’s third film titled Wonderful Life. The film was released in the UK in July 1964. “On The Beach” climbed to #7 in the UK that summer. The film’s plot concerned a guy named Jonnie (Cliff Richard), who works as a waiter on a ferry. He is also plays in a band on the board. A pyrotechnics accident results in the ferry losing power. The band is fired and end up stranded on a small boat. They float around the Mediterranean until they land with their instruments on the Canary Islands. They fumble around on some sand dunes until they discover a movie set and bored actors who they play for. Jonnie and his band end up making a movie. During Wonderful Life “On The Beach” invites the bored actors on the Canary Islands to twist and shout and do the Bossa Nova. The Bossa Nova was a dance craze in the early 60’s in North America and Europe. In Brazil, the word “bossa” was old-fashioned slang for something that is done with particular charm, natural flair or innate ability. As early as 1932, Noel Rossa used the word in a samba. Within the artistic beach culture of the late 1950s in Rio de Janeiro the term “bossa” was used to refer to any new “trend” or “fashionable wave.” In 1957 the term “bossa nova” was coined when Grupo Universitário Hebraico do Brasil gave a concert. A young journalist named Moyses Fuks was promoting the event. In an article he wrote “HOJE. SYLVIA TELLES E UM GRUPO BOSSA NOVA” (“Today. Sylvia Telles and a ‘Bossa Nova’ group”). Popularizing the Bossa Nova were Luiz Bonfá, Stan Getz, João Gilberto, Antônio Carlos Jobim, Astrud Gilberto, Sérgio Mendes, Charlie Byrd and Baden Powell de Aquino. In early 1963 Steve Lawrence and Eydie Gorme had a #2 hit in Vancouver titled “Blame It On The Bossa Nova”. Elvis Presley later that year had a #4 hit with “Bossa Nova Baby”. “Twist And Shout” was a Top 20 pop hit in the USA for the Isley Brothers in 1962. The song was successfully covered by The Beatles in 1963. Though it was only a track on a Beatles album in the UK in 1963, in the spring of 1964 the Fab Four’s version climbed to #2 in Vancouver, the Billboard Hot 100, #1 in New Zealand, #2 in Sweden and the Top Ten elsewhere internationally. By the time Wonderful Life was in theaters it was a definite bonus to have “On The Beach” reference both “Twist And Shout” and the Bossa Nova, as they connected with the teen audience. “On The Beach” missed the charts across the USA. It peaked at #6 in Vancouver and #12 in Toronto. 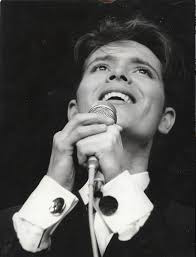 In the 1980’s he scored again with “We Don’t Talk Anymore” and “Dreamin’.” Cliff Richard was among the performers at the Diamond Jubilee concert held outside Buckingham Palace in June 2012. Then, on June 30, 2012, he helped to carry the Olympic torch from Derby to Birmingham as part of the torch relay for the 2012 Summer Olympics in London. Cliff Richard has also been active as a philanthropist. In October 2015 he went on tour at the age of 75. Over the course of his recording career, Cliff Richard has had 68 singles reach the Top Ten on the UK singles chart between 1958 and 2008. Jack Clement writing credits, Discogs.com. C-FUNTASTIC FIFTY, 1410 CFUN, Vancouver, BC, September 12, 1964. Sidney J. Furie, Director, Wonderful Life, Associated British Picture Corporation, 1964.